Free download WindJammers game for PC. It is a sports based fast pace game developed for neo geo platform. WindJammers was developed by Data East while published by SNK. WindJammers can be played on PC by download form this website. 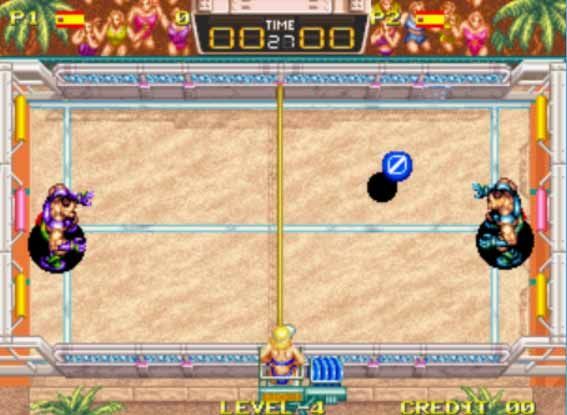 WindJammers PC game is very easy to download and play. There is no need to install this game. You have to download the ZIP folder from the download link given below. After downloading, extract the folder and start to play the game WindJammers according to the playing method given below. When you start the game, you have to select your player. Each player is known by its country. There are six countries include Japan, Korea, Spain, Italy, USA and Germany. After selecting your player, your opponent will be selected as CPU randomly. After that, a playing court is also selected randomly. There are also six playing courts that are Beach, Lawn, Tiled, Concrete, Clay and Stadium. Now you are ready to play the game. You have to hit the ball toward your opponent and try to be missed by him. There are two sets in a round you have to win. If both you and your opponent win then there will be a third set called as Final.